Americano Cured Ham for sale. Buy online at Zingerman's Mail Order. Gourmet Gifts. Food Gifts. 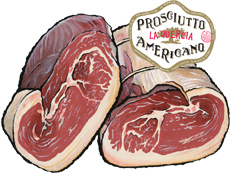 If you want to get an introduction to La Quercia’s cured meats you couldn’t do much better than to start with Prosciutto Americano. This is their mildest, most straightforward cured meat, the one they sell more of than any other. It’ll remind you of Italian prosciutto but the flavors are more forward and there’s more of a mineral tang to the finish. While Italian prosciutto is made with standard breed white pigs raised without any guarantee of their conditions, this is made exclusively from Niman Ranch naturally raised pork. There are no hormones, no sub-therapeutic antibiotics. The pigs are far from being confined; they have access to the out-of-doors and room to root and roam. The pork is not smoked; it's simply cured with sea salt and hung to age for just under a year at Herb’s cured ham house in Norwalk, Iowa. We offer whole hams, which make a great centerpiece for a party, or sliced portions in nitrogen-flushed packages. Rubbed with fennel seed and red chili. The result is a ham with smoky heat and deep savory notes sporting bright flavor that lingers and tickles the throat. I find the tickle is comforted nicely by a small glass of bourbon. To slice whole hams, use a sharp knife and work the ham lengthwise. Don’t worry about getting big slices—focus on keeping the pieces thin, and make sure your bite has a little bit of meat and fat. No cooking needed - this ham is best served as is, just like the Italians serve their prosciutto. Shipped without ice. It's been cured at ambient temperatures through so it's built to last. Whole hams last for months when stored in a cool spot. Storage instructions included.